The "Ministry of Public Buildings" shown in the the 1972 18-bit service list as the "Customer" was actually the Ministry of Public Buildings & Works, renamed in 1963 from the Ministry of Works, a department of the UK Government formed in 1943, during World War II, to organise the requisitioning of property for wartime use, this function was carried on after the war for Government building projects and the acquisition of equipment for the Ministry of Defence. PDP-7 was installed in the computer facility (Building 574) of The National Gas Turbine Establishment Pyestock, which, for over fifty years was the UK's test and development centre for gas turbine engines. In its time it was the largest facility of its type in Europe (if not the world), for the design, experimentation and testing at Pyestock helped to usher in the jet age. It tested Concorde's Olympus jet engines in simulated supersonic conditions, Pyestock's credentials were extremely impressive. There are several web sites showing the now derelict and decaying site of one of the UK's premier research establishments, we would recommend www.ngte.co.uk. During my time at NGTE Pyestock in the computing facility in addition to the PDP-7, other computers in building 574 were - an SDS 9300 mainframe, a PDP11/45 (picture), and an ageing Elliott 803B which had been used for performance and design calculations on aircraft and engines and the processing of aerodynamic data. All of this equipment was later replaced by an ICL 1904S running the George Mk8.64 operating system, two PDP11's and many remote PDP11/10's for data acquisition. The PDP-7 was used for transient instrumentation whilst the SDS 9300 was used for steady state instrumentation, both machines can be seen at the bottom of this page, along with a photo of the SDS 9300 in operation and diagrams of the SDS 9300 (steady state) and PDP-7 (transient) installations. 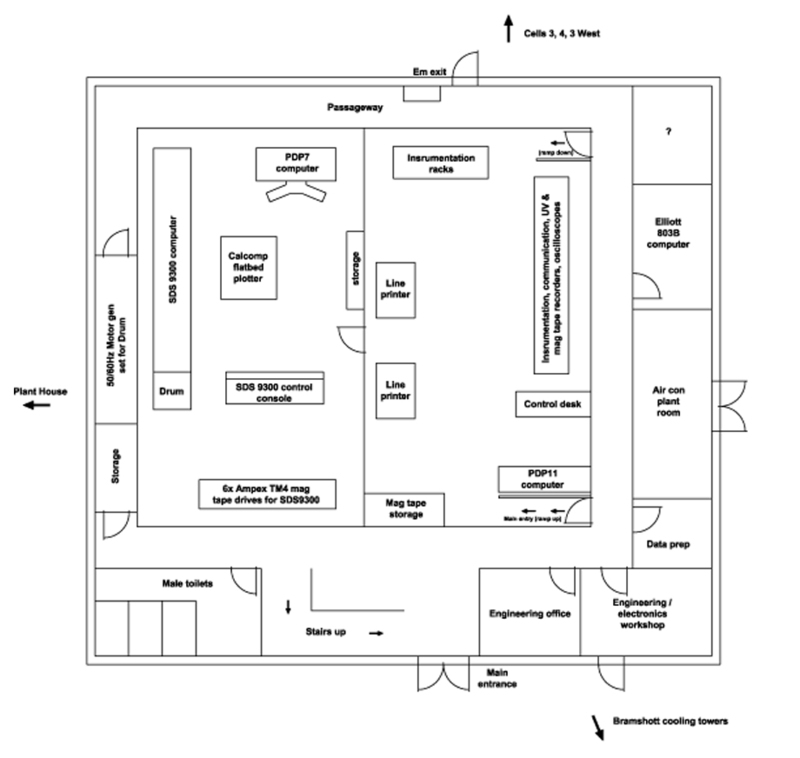 Computer room layout.